Babysoy is a brand that delivers simple and fresh designs, a sustainable and modern wardrode for those eco-babies that doesnt sacrifice comfort or style. They began by making their products with nature's own ingredient - soybean protein fibre (Azlon) and have combined them with other eco-friendly fibres such as organic cotton and rayon from bamboo. Azlon from Soybean: Is a sustainable and botanical textile fibre made from renewable and biodegradable natural resources - its the leftover soybean pulp from tofu and soymilk production. Its 16 amino acids are healthy and nutritional for our skin. It is a green/eco textile fibre that possesses the superiorities of many natural and synthetic fibres. 1. Proteins are extracted from the leftover materials of tofu or soymilk production. 2. Protein liquids are forced through a device called a spinneret, to make liquid soy. This is called wet-spinning. 3. Liquid soy is solidified to make soybean protein fibre. Whats even better is that after the protein has been extracted from the leftover soybean pulp, it can be used as fertilizer. Benefits of Soy: Soybean fibre is a soft, light, and smooth protein fibre. It is smoother than cashmere and has the same moisture absorption as cotton but with a better moisture transmission, making it more comfortable on the skin. It is hydroscopic, breathable, soft, smooth, dry and has superior warmth retention that’s comparable to wool. Azlon from soybean + Cotton/Organic Cotton: We combine the benefits of soybean protein fibre to cotton such as luster, moisture-permeability, quick-dry ability and drape while keeping the cost and your price reasonable and affordable. This is so that more parents can join in on the green movement and more babies can benefit from the healthy botanical textile fibre. In addition, soybean fibre is so soft that it needs a longer length fibre to build a structure for the super soft textile. Helping Our Environment: Babysoy’s baby and tots line are sustainable and eco-friendly. This is because soybean fibre is a textile that is made from recycled material and it does not add any extra burden to mother nature. Poppers + Zips: All poppers and zips are made by world-renowened YKK and are nickel-free, making dressing-time safe and easy. 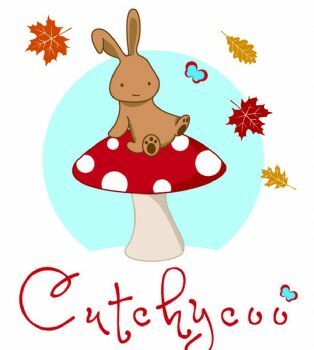 Fire Retardant: Babysoy products are NOT treated with any fire retardant chemicals. Color Palette: Nature's inspiration turns outfit creation into a breeze. 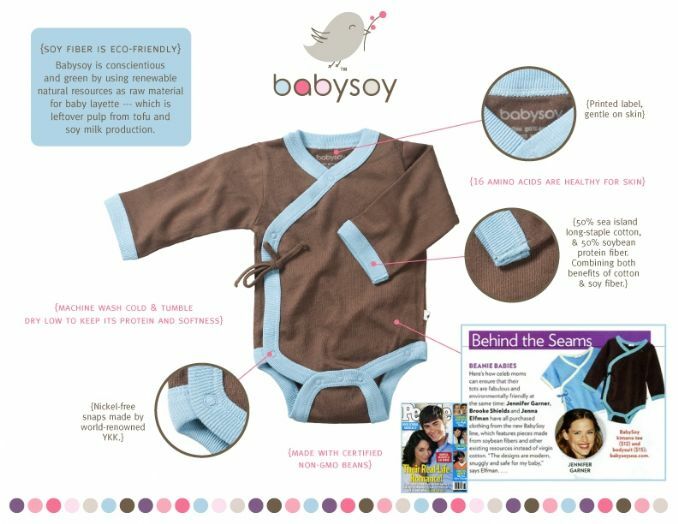 Babysoy is designed to easily mix-and-match from head-to-toe. Fairly Made: Babysoy puts endless efforts in offering parents an eco-friendly and affordable layettes line made by artisans who are fairly-treated in a safe working environment. Co-founders personally conducts unannounced factory inspection at least 4 times a year. Washing Care Guide: Our pre-washed clothes are machine-washable in cold water with like colors. They are also machine-dried using your dryer’s lowest temperature setting. Soybean fibre is a protein fibre, therefore we do not recommend drying with high heat. Heat and hot water will lead to a loss of the fibre's proteins and its softness. It is recommended washing all brand new clothing before dressing baby.